KENNEDY SPACE CENTER, FL--With its engines throttling up to full thrust, launch of a SpaceX Falcon 9 rocket carrying a commercial cargo ship bound for the International Space Station was aborted at the last instant early Saturday when telemetry showed higher-than-allowable pressure readings in one of the rocket's nine first-stage powerplants. A post-scrub inspection revealed the problem was caused by a suspect check valve in an engine turbopump. Engineers with rocket-builder Space Exploration Technologies Corp. worked late Saturday to replace the valve and if no other problems crop up, the company hopes to make another launch attempt Tuesday. "During rigorous inspections of the engine, SpaceX engineers discovered a faulty check valve on the Merlin engine," company spokeswoman Kirstin Brost Grantham said in a statement. "We are now in the process of replacing the failed valve. Those repairs should be complete tonight. We will continue to review data on Sunday. If things look good, we will be ready to attempt to launch on Tuesday, May 22." The dramatic launch abort early Saturday came at the end of a near-flawless countdown. Just a few moments after the International Space Station passed over launch complex 40 at the Cape Canaveral Air Force Station, the countdown ticked into its final seconds, setting up a launch attempt at 4:55 a.m. EDT (GMT-4). "Five, four, three, two, one, zero and lift...off," NASA commentator George Diller said hesitantly, expecting a launch as the nine first stage engines throttled up to full thrust. But an instant later, as a churning exhaust plume billowed in the pre-dawn sky, the engines shut down. "We've had a cutoff," Diller quickly said. "Liftoff did not occur. We've had a launch abort. 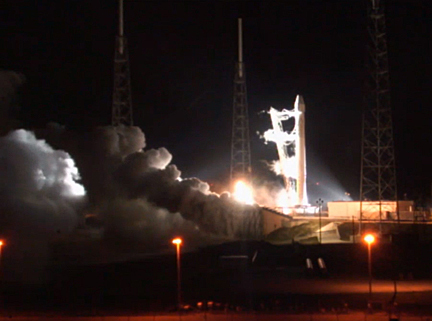 Standing by... We did not get confirmation from the first motion sensor that liftoff occurred. The flight computer is not in startup." 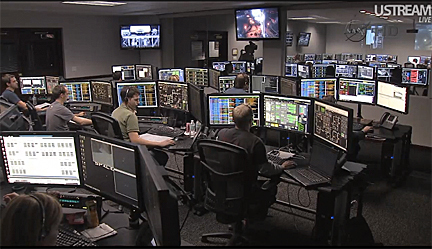 The SpaceX launch control team calmly worked through a detailed abort checklist, reconfiguring various systems to make sure the fully fueled rocket was in a safe configuration after the fiery engine shutdown. "LD (launch director), the vehicle is safed," an engineer reported a few minutes later. "LD copies. As reported by flight software, we had an abort on engine five chamber pressure high." He was referring to telemetry indicating higher-than-allowable pressure inside the combustion chamber of engine No. 5, located in the center of the nine-engine first-stage cluster. The out-of-limits pressure reading triggered a computer-ordered abort a half-second before hold-down clamps would have released the rocket for flight. "We hold the vehicle down with purpose to watch for this exact issue," said SpaceX President Gwynne Shotwell. "Just like a pilot at the end of a runway revs the engines and looks at the gauges, we were revving the engines, we were looking at the gauges and we decided not to fly." SpaceX founder and chief designer Elon Musk, overseeing the countdown from the company's mission control center in Hawthorne, Calif., initially tweeted that it might be possible to resolve the problem by changing the pressure limits in the control software. But Shotwell said "that was early data. Further analysis of the data looks like it's something we want to go in and inspect." After draining propellants, engineers gained access to the first stage engines for a detailed visual and boroscope internal inspection. Later in the day, Musk posted another tweet, this one saying "engine pressure anomaly traced to turbo pump valve. Replacing on engine 5 and verifying no common mode." The next available launch opportunity comes at 3:44:38 a.m. Tuesday, with a third opportunity the next day. The forecast for Tuesday calls for a 60 percent chance of good weather. Asked if the abort Saturday could be viewed by some as a failure for the infant commercial space program, Shotwell said "this is not a failure. We aborted with purpose. It would have been a failure if we were to have lifted off with an engine trending in this direction." SpaceX holds a $1.6 billion commercial contract to provide 12 cargo flights to the space station for delivery of more than 44,000 pounds of equipment and supplies. The company initially planned three test flights under a separate contract valued at up to $396 million. The first test flight was successfully carried out in December 2010 when a Dragon capsule was lofted into orbit and guided to a successful splashdown in the Pacific Ocean, the first commercial spacecraft ever recovered from orbit. As originally envisioned, the second test flight would have tested rendezvous procedures and included a close-approach to the station with berthing deferred to the third flight. But SpaceX successfully lobbied NASA to combine the second and third test flights into a single mission. The goal of the combined test flight is to rendezvous with the International Space Station and in so doing, demonstrate the Dragon capsule's ability to autonomously fly a precise trajectory, respond to commands and to safely abort an approach if something goes wrong. If all of that goes well, the capsule will maneuver itself to a point just 30 feet below the space station where it will be grappled by the lab's robot arm and attached to an Earth-facing port on the lab's forward Harmony module. The Dragon capsule is loaded with about 1,500 pounds of supplies and equipment. If all goes well, it will be detached from the station at the end of the month and return to Earth with a splashdown in the Pacific Ocean off the coast of California. Routine cargo delivery missions are scheduled to start later this year, assuming no major problems develop during the test flight.